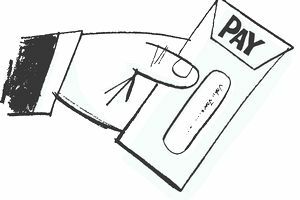 Wage garnishment happens when your employer withholds part of your compensation to pay your debts. Your wages can only be garnished as the result of a court order or a similar legal action and shouldn't come as a complete surprise. It’s important not to ignore a lawsuit summons. If you do, you lose the opportunity to fight a wage garnishment. The Consumer Credit Protection Act regulates wage garnishment, specifying the maximum amount that can be garnished and prohibiting employers from firing you because of a single wage garnishment. Up to 25 percent of your disposable income if it’s greater than $290. Any amount greater than 30 times the federal minimum wage: $217.50. For wage garnishment purposes, your disposable income is your gross income minus legally required deductions including federal, state and local taxes, unemployment insurance, social security deductions, and state retirement systems. Other deductions like health insurance, life insurance, and charitable contributions are not legally required and therefore are not used to determine your disposable income. The maximum wage garnishment limit applies regardless of the number of creditors seeking garnishment. Normal restrictions on wage garnishment limits do not apply to bankruptcy court orders, federal and state tax debts, voluntary wage assignments, or child and spousal support. Federal minimum wage is currently $7.25 per hour, and generally, only certain types of payments can be garnished. This includes wages, salaries, commissions, bonuses, or other income. Pension and retirement income can also be garnished. Generally, tips are not garnished since the wage garnishment law doesn’t consider them to be income. Social Security benefits cannot be garnished, except by the Federal government. Most states have their own laws regulating wage garnishment. Where state wage garnishment law is different from the federal law, the law that results in the lowest amount garnished should be applied. For example, if your state’s law decree that only 15 percent of your disposable income can be garnished, that law would be applied instead of the federal law. Federal agencies and their collectors are allowed to garnish up to 15 percent of your disposable income to cover non-tax debts that you owe the federal government. In addition, the Department of Education or its collectors can garnish up to 10 percent of your disposable income to pay back federal student loans in default. State garnishment laws don’t apply when the debt is to the federal government. Under the Consumer Credit Protection Act, your employer cannot fire you for having a single debt garnished from your wages. However, the Act does not prevent the employer from firing you after two or more debts are garnished separately. If you believe you have been improperly fired because of wage garnishments, contact the Department of Labor. You may be able to have your job reinstated. If the Department determines that your employer knowingly violated the law, civil and criminal charges may be pursued. If your disposable income is $217.00 per week, then a creditor would not be able to get a wage garnishment against you. If your disposable income is $290 per week, then you have $72.50 eligible for garnishments. If your disposable income is $400 per week, then you can be garnished for up to $100. Let’s say your disposable income is $500 per week and you currently have a $250 garnishment for child support (the 50 percent legal maximum when you are supporting another child or spouse). Another creditor would not be able to get a garnishment against you because you already have the legal maximum being garnished. The Wage and Hour Division of the Department of Labor can give you additional information about having your wages garnished. You can contact them online at www.wagehour.dol.gov or by calling 1-866-487-9243.